A basic explanation of the structures and functions of the eye are introduced here to help understand how glaucoma affects the eye and vision. The diagrams are provided to more easily visualize various terms mentioned on this website. Please also view the video animations linked at the end of this article. 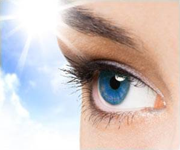 The cornea is the outer surface and protective covering of the eye. Of relevance to glaucoma risk factors and the cornea, are 'central cornea thickness' or CCT. Generally, a lower CCT is considered to correlate with a larger risk factor for glaucoma, but there are new recognized factors related to the cornea which may be more important diagnostically. There has been new research and understanding related to the bio-mechanical factors of the cornea such as corneal hysteresis or CH. Bio-mechanical factors can be measured by newer instruments such as the Reichert Ocular Response Analyzer (ORA). Behind the cornea is the anterior chamber of the eye containing the aqueous fluid. It is produced by the ciliary body. It then exits via the drain or Trabecular Meshwork. Because this is the area where pressure develops in the eye, we will describe it in more detail. As light passes through the front part of the eye, it goes through the opening called the pupil and then impacts the lens. The iris is a light sensitive tissue which opens and closes in response to the amount of light present, and thus regulates the light level in the eye by changing the size of the pupil - similar to the way older camera apertures worked in regulating light levels. Once light hits the lens, it is focused via the ciliary muscle. Once the lens adjusts its shape to focus the image, it impacts the retina at the back part of the eye. The retina, which is an extension of the optic nerve, functions as a photographic film (or sensor array in newer cameras) and is made up of special light sensitive cells called ganglion cells (RGCs). RGCs are of special interest in glaucoma as they are impacted by this disease, and as these cells are lost, the results appear as defects in the "visual field". The purple area is the Choroid. The posterior of the choroid forms a supporting structure around the optic disk. The choroid, nerve tissue, and arteries, seem to be impacted by glaucoma, and this leads to the ‘cupping’ mentioned above, and to excavation of the nerve head. The vitreous humour is the gel like substance which gives the eyeball its shape and form, but is not directly implicated in eye pressure. The anterior part of the eye is of interest in understanding glaucoma and ocular hypertension because it constitutes the eye anatomy and physiology where aqueous humour is generated and then drained to the outside of the eye. It is failure in the balance of aqueous humour (AH) production (inflow) vs drainage (outflow) which accounts for the largest known risk factor in the progression of glaucoma, high intraocular pressure. The AH is produced in the ciliary body where it travels in front of the lens, through the pupil, and over the top of the iris to the Trabecular meshwork or 'drain.' There can be numerous causes for increased intraocular pressure in this process. In ocular hypertension (OH) or primary open angle glaucoma (POAG), there can be too much AH produced, but the main problem is usually the failure of the TM to properly drain the fluid. Another source of failure in Closed Angle Glaucoma (CAG) when either the AH, because of a constricted angle, can not bypass the pupil (pupillary block), and/or cannot reach the drain because the closed angle obscures it. In the latter case, the drain itself may be functioning normally, but there is an overlap of conditions where POAG and CAG occur simultaneously. This is discussed in more detail in the Narrow Angle Glaucoma article. For some very good 3d animations depicting the structures, functions, and some of the processes discussed, view some of the videos at 3d Eye Online.